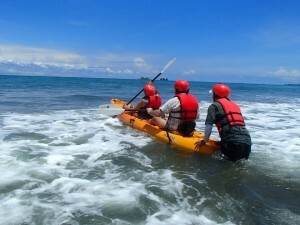 This Kayak trip begin at low tide as the waves go to one side of the Tombolo or better known as the Whale’s Tail, which is one of the best spot for snorkeling in Costa Rica and at the Ballena Marine National Park. You will paddle to this point for 30 to 45 minutes , depending on your experienced. As paddling to one of the best Costa Rican reefs you will enjoy a magnificent view of the mountains and the coast of Costa Ballena and Uvita. As soon we arrive to the reefs , our guide will give you the instructions to start the Snorkeling session that last about 40 minutes to one hour. 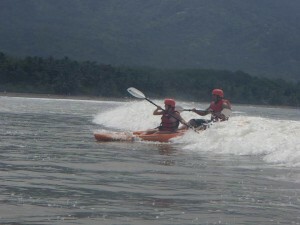 The second stage of this activity is to do Surfing with the Kayak in the shore of the Whale’s Tail ,which is fun and suitable for all types of people. 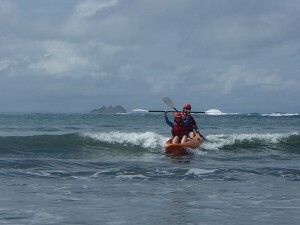 Then as we reach the beach, the tide allow the kayaks to enter into an small mangrove forest which is protected by the Ballena Marine Park where it is possible to see some wildlife of this habitat . As you paddle in the channels of its tranquil waters you will learn about the importance of this ecosystem and about the species that live there. If the time allow us ,the guide will take you for a short walk in the trails that surround the mangrove forest and see more of this wonderful place. Tour includes: Bottled Water, fruit, cookie s, ICT certified touristic guide ,equipment (kayak, paddles, life jackets and helmets) and entrance fee to Ballena National Marine Park. Click here to book your Kayaking Tour now!